TRIGGER - 1980 to about 1986, came in three incarnations. For the first one I was the sound man from Feb-Oct 1981. The bass player left in October and I brushed off the Fender and became the bass player to the end. Trigger played lots of eastside bars and private functions. We were the house band for two bars at different periods: The Juanita Tavern (now Blarney's), and the Irish Rose Tavern on Rose Hill in Kirkland (just closed as the Rose Hill Alehouse in January, 2002). Our last gig was at Waldo's Tavern in May of 1986. At that gig, Rick Erickson, who has an Eastside amp repair business now and still plays, substituted for Gregory, the original lead guitar. 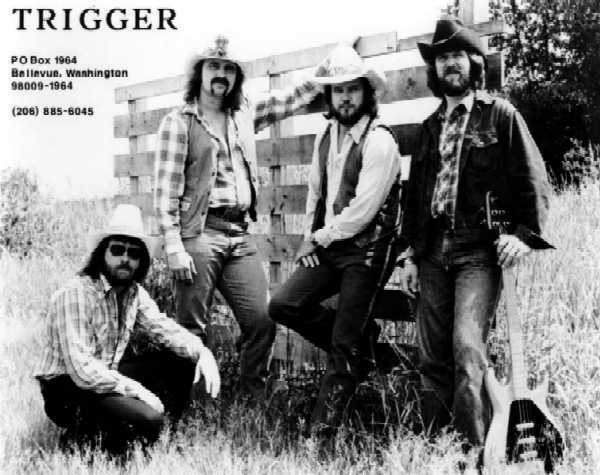 The first two incarnations of Trigger were country/rock cover bands (Eagles, Alabama, etc). After the original drummer (Bill) left, in August of 1984, we transitioned to an "original" music pop band, while also continuing to cover current hits. Too bad all the originals had a mid-70's feel - we were no competition to the emerging garage/grudge groups. What a great website!!!! Hey FYI: I am the (Mary?) listed with the 80's band, "Trigger." My maiden name then was Mary Beswick. I sang with the group briefly in the early 80's in all the "great" Eastside taverns. Wow, a million years ago. Since then I have been travelling the world. I did USO (DoD) tours in Europe and South Pacific, worked for Greg Thompson productions in Miami, St. Thomas and Nevada. I've been in too many big hair and no hair bands, but always worked! Now I am old, but still performing. I am the lead vocalist and leader of the group The Rave, with many NW's best musicians Mike Langdon- guitarist (The Jesters, The Trolley), Dave Moore-keyboards/bass (Harbor Band) and Dave Heath-drummer (wish I knew the names of his old bands). Anyway, we have been the house band on The Royal Argosy, since 2002. Before that we were the house band on The Spirit of Puget Sound (1994-2000). Probably too much information, but glad to see such an amazing website. Keep up the good work! Trigger was together from 1980 - 1988. Gregory Kreider was the Lead Guitarist throughout. 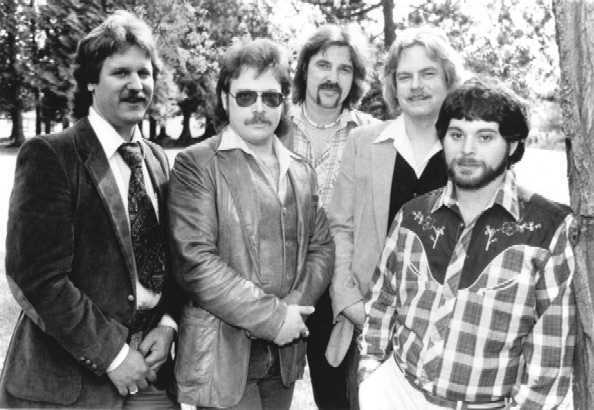 Rick Erickson played one or two shows with the band, substituting for Gregory because of Gregory's back problems and ensuing surgery. 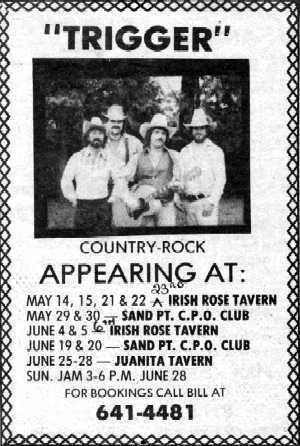 The last gig was at Waldo's Tavern in May of 1987. The band was recording for at least a year after that, with Gregory contributing songs, guitar and vocal parts. Ron Gangnes began working with the band about a year after I joined, but was no longer working with the band during our final recording project. With great sadness, I must report that Gregory Kreider died on 27 February 2012 following a heart attack. He founded Trigger, and was its essential foundation. He played the guitar with real fire. I've spent most of my life playing in bands with him, learning how to play a guitar by watching and listening to him. Our nonverbal communication was extraordinary. Some of the other Pacific Northwest music groups represented in members of this group include: III Generation, Clear Light, Prophecy, Cloud, Moonstone, Prophecy-2, and many others NW bands.